Fashion model Marije Popping shares her tips on how to easy curl your eyelash with a spoon! Last weekend I had a sleepover at a friend’s house after we had walked a show together in Rotterdam, because it was too late for me to go back home by train. The next morning I had to get up early for an assignment. Most of the time I just curl my eyelashes and put on a nice day cream. But now I had nothing with me. Until I remembered a shoot I did a long time ago, where a makeup artist used a super simple method. She curled my eyelashes with a teaspoon instead of using an eyelash curler! So it seemed fun to me to give it a try. I found out it is very easy and quick to do! First you position the teaspoon in your hand correctly. Place the handle of the spoon in the palm of your hand and hold it with your ring, pinky and middle finger. Turn the inside of the spoon towards you and place your thumb at the bottom and your pointing finger on the top of the spoon. Now you can curl it. 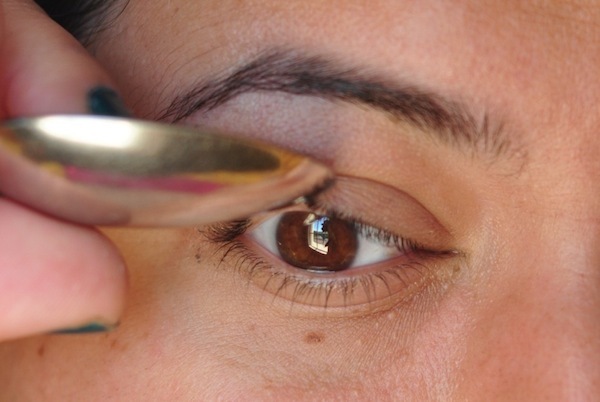 Place the bottom side of the spoon, where your thumb is placed, on top of your eyelashes. Press them towards the spoon with your thumb. Continue until you have the desired eyelashes. That’s basically all you have to do! This method is cheap and easy, and it works even better than a real eyelash curler. Your thumb heats up when you press on it, because of your natural body heat. And that heat makes the curl last a lot longer than normal cold eyelash curlers. This method is also recommended when you have small eyes, deep-set eyes or when a normal curler just doesn’t help. Do try this at home!